Want to take a quick trip for the weekend? The Short North Arts District makes an excellent getaway. Here’s what I suggest you do with 36 hours in the neighborhood that’s known as the “art and soul” of Columbus. Day 1 Begin your morning with a leisurely breakfast at one of the district’s favorite tucked-away eateries, like Katalina’s Café Corner or Tasi Café. Use the rest of the morning to explore the Short North. Embark on the neighborhood’s Art Walk tour, and along the way, step off the path and browse local art galleries. Many of the top Columbus restaurants are located here, so for lunch, skip the turkey sandwich. Indulge in the moule frites at gastropub Arch City Tavern or savor quick and delicious Mediterranean food with a healthy twist at Brassica. 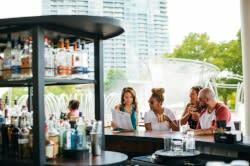 Those who enjoy craft beer and local wine will want to spend the afternoon sampling libations at the independent breweries, cocktail bars and wine shops here. If you’re into beer, try: North High Brewing, Barley’s Brewing Co. and Seventh Son Brewing. Prefer wine? Order a flight at Wine on High. Cocktails at Mouton or Denmark are always a good idea. Take some time to recharge and check into your hotel before dinner. Choose from several cozy bed and breakfasts, including Harrison House, Victorian Village Guest House and 50 Lincoln-Short North Bed & Breakfast. When you start to get hungry, it’s time to head out for dinner. I personally love Italian fare, and the Short North is home to many of my favorites. You can’t go wrong at Basi Italia or Marcella’s. Afterwards, catch a Short North Stage show at the historic Garden Theatre, or satisfy your sweet tooth at Jeni’s Splendid Ice Creams. Day 2 Sleep in – you’ve earned it! Once you’re up, it’s time for brunch. Stuffed French toast at The Pearl is a favorite. Then, before you head home, take a couple of hours to browse the Short North boutiques. You’ll find everything from original fashion by local designers to shabby chic homewares. 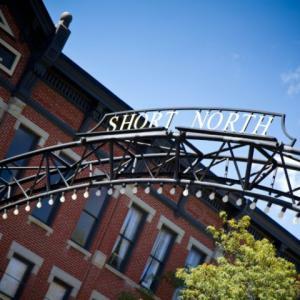 Find more ideas for things to see and do in the Short North here. This post is written by Sandi Matgouranis, marketing coordinator for Experience Columbus. You can follow Sandi on Twitter @Sandi_ExpCols.